Stand mixers have become some of the most popular kitchen appliances in the last couple of years. They have revolutionized the way we mix our ingredients to bake different desserts and even cook whole meals. These stand mixer reviews will showcase some of the different name brand appliances you can find for a reasonable price. They all pretty much have the same end result but have different features and colors for you to choose from. This is the one you have been waiting for with stand mixer reviews. 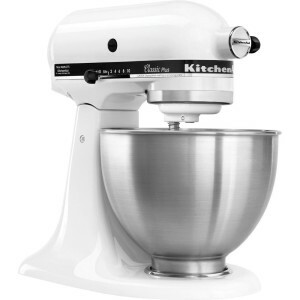 KitchenAid has paved the road for stand mixers when it comes to efficiency and professional look. There are many other stand mixers out there but none compare to this one right here. There might not be as much power backing up the motor, but the 275 watts of power is more than enough to get the job done. There are 10 different speed settings that allow you to slowly mix some eggs or dry ingredients or quickly mix your cake batter to make it perfect. The locking tilt-head function is fantastic for cleaning and simply using the machine. The entire appliance is made of metal which makes it more durable than most other stand mixers. One of the best things about KitchenAid is the attachments are universal. There are tons of different attachments available that fit all of their stand mixers. You can add a meat grinder, pasta roller, dough hook and many other attachments. This classic stand mixer comes with over 15 attachments initially. You will get the wire whip, dough hook and flat beater to get you started. 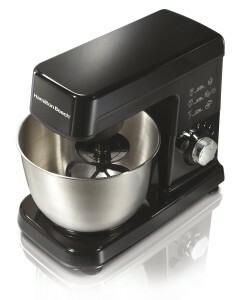 When you think of a stand mixer you usually don’t think of Hamilton Beach. This company actually produces one of the popular stand mixers on the market. Some of the cheaper stand mixers use the generic double whisking action as you use with a hand held mixer. This stand mixer uses one mixer that covers the ntire bowl to give more mixing coverage. There are 300 watts behind this powerful motor to ensure even the toughest ingredients will be mixed with ease. The mixers with one beater end up mixing better and more efficiently than those with two beaters. There are 3 different attachments that come with this Hamilton Beach stand mixer. This gives you a wide variety of how you can use this mixer. You don’t only have to make cookie dough or bread dough anymore. There is a large whisk so you can mix your dry ingredients easy before adding your wet ingredients. There is also a dough hook to make kneading your dough a breeze. You no longer have to wear out your hands by kneading your dough manually on the counter. This particular appliance is available in two different colors: black and chrome. Sunbeam is another company that makes tons of different appliances for kitchens these days. When it comes to the stand mixers, most people don’t want a boring silver color for their kitchen. The stand mixer will usually get used multiple times in a week and might end up getting left on the counter permanently. If that is the case, most cooks would want a colorful stand mixer to accent their kitchen color scheme. 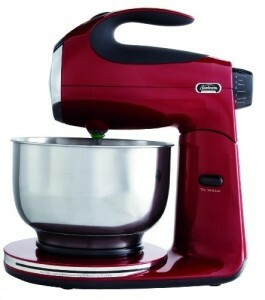 This Sunbeam stand mixer comes in an amazing 8 different colors. Aside from the color of the appliance, the functionality is also very important. There are 12 different speeds with this stand mixer. This allows you to start on the softest speed and slowly work your way up to the strongest speed at your own pace. The bowl and beaters are synchronized to give you 3-way mixing action. This appliance has 350 watts of power backing the motor. The bowl is off-center and this allows the user to add the ingredients while it is mixing. There are chrome beaters and dough hooks to give more variety when it comes to what you can mix in this stand mixer. American Era is a brand that is not as widely known as the others in the stand mixer reviews. Don’t count this one out yet though. The layout is pretty different of this mixer than other stand mixers. The base is much larger and the top that holds the beater is larger as well. 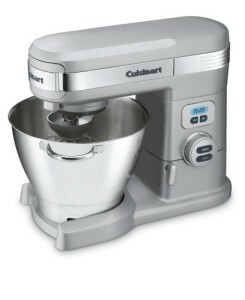 There is only one beater with this mixer, which means it has a better mixing efficiency. There are only 4 speeds of mixing but there is a pulse function as well. Other mixers don’t have a pulse control function. This makes it easy to mix tough ingredients without having to leave the mixer running for a while. This pulse feature is also great because it gives you a quick start and stop control. There are 3 different mixing blades included with this package. The first is the generic beating blade that you will use for the majority of your cooking projects. The next is the dough hook that helps knead all types of dough. The last is the whisk attachment that is great for mixing ingredients that involved eggs and dry ingredients. The mixing bowl is made of stainless steel and holds 6 quarts of material. This appliance comes in a metallic red to give it a modern feel. Cuisinart has yet again made an appliance that is very popular and widely used. This stand mixer in particular is extremely durable and can mix at a very powerful speed. There are 800 watts of power backing up this motor to let you mix and knead all kinds of ingredients no matter how thick they are. It is available in 3 different colors: brushed chrome, white and black. Each housing unit is made from a die-cast metal which makes it very durable and can withstand a lot of wear and tear. The head of the machine has a tilt-back function which makes it easy to add ingredients and to clean out the bowl.